The title of this book is so over-the-top that I decided I had to read it when I was offered a copy to review. 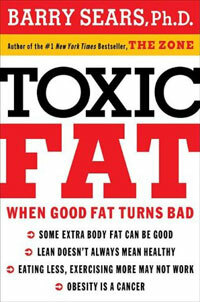 Toxic Fat: When Good Fat Turns Bad sounds like the title of a B-grade horror movie and the cover is loud enough that I could hold it up in the street and stop traffic. The book is written by Barry Sears, who is probably most famous for creating The Zone Diet. Let me break down the good and bad things about this book, starting with the good since I’m a positive person. Dr. Sears relays a lot of information about how being fat does not necessarily mean you’re in bad health, an idea which seems to be catching on in the mainstream media and will hopefully help in the fight against fat discrimination. He also explains why being a bit fat can actually protect you from having too much AA in your bloodstream. He explains in a bit more detail why some people are naturally fatter than others, due to the efficiency of their “fat traps” i.e. their bodies efficiency at converting stored energy in fat cells into a substance called ATP which is the immediate source of energy for your body’s cells. I learned that in 2011, when the first of the baby boomers are eligible for Medicare, we’re going to be pretty screwed because there will be a lot of sick people who expect the government to pay their medical bills. The book promotes what seems to be a fairly sane diet which contains a balance of protein, carbs, and fats. That diet just happens to be The Zone Diet, also created by Dr. Barry Sears, and coincidentally enough, the solution to all your toxic fat problems. And if you didn’t already know that Dr. Sears wrote The Zone Diet, as well as about a dozen other books related to The Zone Diet, he’ll be happy to tell you all throughout the book. He’ll also keep using phrases like “Toxic Fat Syndrome” and “Perfect Nutritional Storm” over and over again, like a politician drilling talking points into your brain with a diamond point drill. Some of the technical information involving molecular processes in the body isn’t that easy to understand. Granted, it’s complex information, but a couple more diagrams or illustrations would have been helpful. The book is somewhat repetitious and could have been 100 pages shorter, the same as most diet books. While Dr. Sears is a capable writer, his prose is not extraordinary and I had to force myself to continue reading at points. Also, like most diet books, it fails to give a holistic view of why people gain weight and why it’s hard to lose it. On page 86 he says “Losing weight is incredibly easy as long as you are never hungry.” I have to vehemently disagree with that statement. There are plenty of times I have overeaten because I’ve been sad, because I’ve been happy, or just because someone placed a box of bagels 12 feet away from me. Obesity is due to medical, psychological, and environmental factors, and no single book I’ve read on obesity covers all three of those topics. It’s hard to take a book seriously where the author heads to the frozen prairies of Saskatchewan to corner the world’s borage seed market. Overall, you’re not missing much if you don’t read this book, but if you do you might learn some things about molecules in your body that you never knew existed. 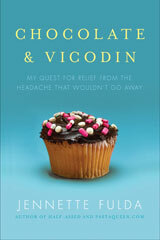 p. 239 – “Let food be your medicine, and let medicine be your food” by Hippocrates. Disclosure: The link to “fish oil” in this post is a sponsored link. 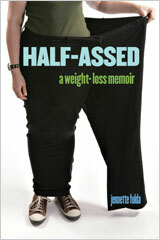 Also, like most diet books, it fails to give a holistic view of why people gain weight and why it’s hard to lose it. That’s because if they came right out and gave the real answer, they’d never sell any more books. Which is why my book is different. I’m not interested in selling any more and I tell you right on the cover that I can’t help you at all. I’m a HUGE nerd (I actually use my library card) and I love book reviews like this that give the pros and cons. Thanks! Well gee, that would work if I didn’t eat when I *wasn’t* hungry. That oversimplification by an ‘expert’ just shows how little obesity and its causes are understood. I recall going to hear him speak back in the DAY…1994? when the zone was a book mainly for people in the medical field (then he realized what he was on to :))….I BARELY understood a word he said it was so full of medical jargon. but I admired his brain. I wanna read this now too. One thing I notice about “experts” is that they are always trying to sell their old book in their new book. A book deal is really not that much of a money maker since it is a commodity. The money maker is when the author is able to bridge the book into motivational coaching or speaking gigs. I think it is the same thing in the music industry. The first CD really does not make that much money for the artist. It is the tours and the followups CDs that will bring them the dough. Anyhoo, I just hate it when it feels like you are reading a sales pitch for the older book in a new book. The new has to be really really good in order to make me want to take a peek at the older one. Thanks for doing this review. The problem with most diet books for me is that they have about 2 chapters in them that I really want to read: the actual diet plan and the recipes. All the rest I usually just skim over. That’s why libraries and bookstores like Borders are so great because I can grab the book then sit in one of their chairs to read and see if it’s worth actually buying. 1. No need to buy book. 2. Add more fish oil to my morning smoothie and up the cinnamon supplements too. Okay, that’s it. I’m going to have to find a psychic lawyer and sue you for proactive plagiarism. Either that, or learn to read faster. I’m still halfway through the book. I agree sounds like more of the same, though the bit on biochem sounds interesting, but I have a Master’s degree in bio so my interest is probably greater than most. In regard to the idea that being fat doesn’t mean you’re in bad health I can say is totally true. I took part in a research study at UT Southwestern (Massive medical reasearch center in Dallas) that looked into body fat distribution in relationship to blood sugar regulation, cholesteral, and triglycerides. As you may be familiar with the “bad fat” or the fat that tends to be metabolicly active is the viceral fat that surrounds the internal organs. The subcutaneous fat is OK fat. They did a bunch of lab work and did multiple MRI’s. The result- I have almost no viceral fat, despite the fact that my BMI is 36. The researchers were very suprised, they said that while I wasn’t unique I was rather very unsual. I don’t eat anything with refined sugar and I try to get a good amount of omega 3’s. I guess in general I try to follow the south beach guidelines, or close to it. They said that looking at my internal organs they would have guessed I had a BMI in the 20’s. They said that while I still needed to lose weight I was in perfect health and that at this time I wasn’t experiencing any negative health effects as a result of my obesity. It was a pretty cool experience overall…plus they paid me $150 dollars to basicly get a very complete and detailed yearly physical! “Let food be your medicine, and let medicine be your food”…love that quote. This is my whole philosophy behind eating wellness. Great review. I have the older Zone Diet books and it worked for me to some degree. But I agree there is not enough holistic approach. And yeah, the words “Toxic Fat Syndrome” that would have me waking up in the middle of the night swaeting if it were burned into my brain. PQ..for what it is worth, the board certified endocrinologist I’ve been working with to help figure out why I could ride 105 miles on a bike and not lose weight…. thinks the zone is the best diet…but too damn hard for people to follow (“too much math I’ve found”). THanks for summarizing the book. Great work. (And BTW.. she thinks the next best eating plan is South Beach). I’ve nominated you for an ‘I Love Your Blog’ award, see my blog post for details! @Merry – Great minds think alike! And I’m happy to hear there is someone who reads at least as slowly as I do. Jennette, have you ever posted about what it’s like to no longer be shielded from social / sexual attention by an “unacceptable” body? I wonder if it’s scary to be asked out on dates, or even just out to lunch, by people you don’t know well, in light of the possibility that you might have been a little socially isolated during your adolescence and might not feels as though you’re “up to speed” with some of your peers. (I actually had something like this experience: I started dating in my mid-twenties, and one of the things that really slowed me down was the feeling that I was different and everyone else knew how to do this and I didn’t.) Maybe this is a really dumb question. Maybe your answer is, “How would I know, lady? I’ve lived the only life I’ve lived and have no idea if other people are more or les nervous than I am on a first date.” So, just ignore this comment if it’s annoying. I weigh-in tomorrow and reading all your posts have motivated me to hit the gym again tonight and have fish for dinner. Thanks for the review!! Very helpful. But, I have to admit when my vision first caught the post. If you look out of your periphrial it could be about Britney Spears:Toxic… I had to do a double take. The Zone diet was the best diet I’ve ever been on. I lost a bunch of weight and I felt great the whole time. It’s actually similar to South Beach in that carbs aren’t totally restricted, just less in proportion to protein than the way most people eat. Some people are put off by the math but after the first 2-3 weeks you get used to knowing the right serving size of the foods you usually eat, and you learn how to estimate for the unfamiliar foods. I wish I were still on it, but I just found it too hard and too expensive to eat so much protein and so few carbs. It’s too countercultural. But the more closely I stick to those principles, the better I feel and look. That said, I found the books totally unreadable. My mom the nutrition nut eats them with a spoon, but to me all the talk of eicosanoids and the different happy fats comes off as nutso-cuckoo. Well, that’s just ridiculous. Hunger is the body’s way of letting you know it’s time to eat, and when it’s time to stop. Does he want us to override our natural metabolic signals and eat when we’re not hungry? Cos for me, that’s what got me fat in the first place – eating because it was “time to”, or because I felt sad, or out of control, or angry… basically for any reason other than my tummy told me to. The secrets of losing and maintaining weight appear to be learning to a) welcome a little hunger at the right times, as it means you ate about the right amount of calories at the last meal and you’re on track and b) recognise the difference between real bodily hunger and emotional hunger, feeding your soul, not your mouth, if that’s what’s hungry. Unfortunately people don’t want to hear the truth. It takes a bit of effort to stay healthy. The zone diet is probably the most worthy of lifestyles to follow. Takes a bit of getting used to but does the trick. By eating in the zone you are limiting high glycemic carbs, refined sugars and increasing your vegetable servings by about 5x per the current recommended amounts from the FDA. His science is spot on and if America would just wake up and listen to the likes of Dr. Sears we would have no need to increase taxes to cover the cost of all the very unhealthy people in our country. You are not reading a novel..it is scientific and has to be easy enough for the average pereson to understand.